A few days ago, I received some info from co-organizer Michael McNeil about the 2019 Northwest Pen Round-Up! being held in Portland on Saturday July 13. This annual, one-day pen extravaganza is free and open to everyone. It's also the closest pen event to Vancouver, so I hope you can make it! (photos from previous Round-Ups can be found here on our blog ). We are pleased to announce that the 7th Annual Northwest Pen Round-Up! will be held on Saturday, July 13th, 2019, at the Lucky Labrador Brewing Co. in Portland, Oregon, from noon until 5:00 p.m. The Lucky Lab (1945 N. W. Quimby) is located very close to downtown in the Northwest section of Portland. It is the same weekend as the largest antique show in the Northwest, the Christine Palmer Antique Show. The Portland antique show is huge; for decades it has attracted sellers and dealers from all over the West Coast. The show has Friday early admission and runs through Sunday. We have had collectors from all over Oregon and the Northwest, B.C, California, Arizona, Iowa, and other states who have attended the Round-Up. There will be something for every kind of collector of writing instruments, from the beginner to the advanced collector. We have often had distant visitors to our meetup who have scheduled vacations in conjunction (with the Antique Show). The Round-Up is the largest gathering of writing instrument collectors in the NW. Many Seattle and Portland pen club members will be attending. In the past, there has been plenty to see, sell, trade, admire, learn about and discuss. It is also a great opportunity to meet other collectors. If the past is any guide, there should be quite a number of extraordinary vintage pens for sale as well as lots of modern pens. The event room has air conditioning, so that's cool, literally and figuratively. The Lucky Lab serves a variety of food and beverages at reasonable prices. It is a converted old truck manufacturing plant. There is plenty of on street parking nearby. A number of people have planned a summer vacation around the pen show and the antique show. 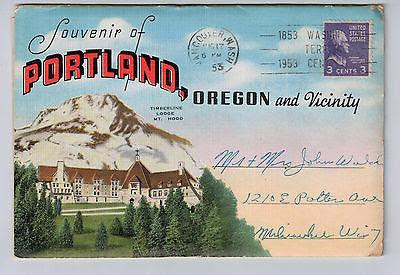 Portland is situated in a very scenic area of the country, near the Cascade Mountains and Pacific Ocean. The Pacific coast always has cooler weather than Portland and seldom does it get above 75 degrees. There are plenty of things to do in Portland. Portland prides itself in being a little off beat and it is always an interesting city to visit. Portland has its own unique charm, with lots of interesting restaurants, Powell’s Books, scenic tourists’ sights, etc. All pen/writing instrument collectors/aficionados are invited. We do not limit this event to just people from the Northwest or the West Coast. Admission is free. We only charge a nominal fee for vendors who want to set up. If you would like table space, please contact us early, as space is limited. It will be a very casual event, and you can sell even if you are not set up. Keep in mind, there is no sales tax in Oregon.